Last year, Netflix dropped the high-budget “Bright” just before the holidays and it turned out to be a pretty massive sci-fi hit for the company, even if critics hated it. So, apparently, futuristic action movies are now going to be what the company gives us for Christmas every year. How’s this year’s cinematic sci-fi stocking stuffer, "Bird Box"? It’s imperfect, but you probably won’t be returning it. Undercooked metaphors about motherhood and a mishandled climax aside, there’s enough to like in Susanne Bier’s “Bird Box,” premiering on Netflix after a limited theatrical release today. Most of its strength emerges from a well-directed ensemble, one able to convey the high concept of a nightmarish situation without losing their relatable humanity. Lazy critics and viewers will compare it to “A Quiet Place” (I've already seen it called "A Blind Place"), but this is a piece that actually draws more from “Stephen King’s The Mist,” another tale of the paranoia that invades a group of strangers when they’re dealing with both the unknown and the worry that they may never again see the outside world or fully understand what's hiding in it. I'm a sucker for King-inspired things, and this one hits that chord well enough to be worth a look over your Christmas break. In particular, Sandra Bullock does typically solid work, buoyed by a great supporting cast that includes the should-be-a-star Trevante Rhodes, Jacki Weaver, Danielle Macdonald, Sarah Paulson, and John Malkovich. 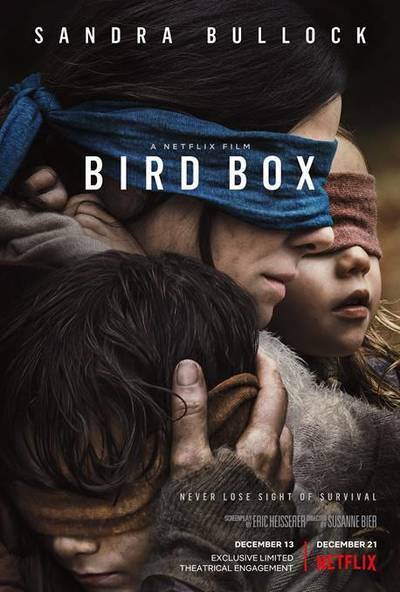 Based on Josh Malerman’s novel, “Bird Box” intercuts between two time periods—about five years after the end of the world and in the first days when everything collapsed. It opens in the nightmarish present, but actually spends more time in flashbacks with Malorie (Bullock), an expectant mother unsure about whether or not she’ll form a connection with her baby. She expresses as much to her sister Jessica (Paulson) on the way to a meeting with her obstetrician, as the two discuss reports of mass suicides on the other side of the world. And then “whatever” is happening over there comes home as people start to hurl themselves out of windows and into oncoming traffic. These early scenes of absolute chaos are well-handled by Bier and honestly terrifying. She captures complete chaos on what appears to be a relatively limited budget, realizing the power of stark imagery—a woman bashing her head into a glass window or another calmly getting into the driver’s seat of a burning car—over the CGI overload we so often see in post-apocalyptic movies. What is driving the mass suicides? Anyone who is outside “sees something,” although what they see is left marvelously undefined. Whatever it is causes their eyes to go all psychedelic and they take their own lives. (Well, most of them do. But that’s for later in the movie.) A small band of survivors takes shelter, including the irascible Douglas (Malkovich), also-pregnant Olympia (Macdonald), excitable Charlie (LilRel Howery), and inevitable love interest Tom (Rhodes). As they run of out of supplies and realize that they’re going to have to get to a store somehow, distrust grows. And no one can quite agree on whether or not they should ever answer the door. The “survivors” material is intercut with the present-day material of Malorie and two children called only Boy (Julian Edwards) and Girl (Vivien Lyra Blair) on a journey down a treacherous river. They wear blindfolds and are reminded constantly by Malorie that they better not take them off—no matter what they hear. The fact that we only see Malorie, and what anyone who’s seen a movie can presume are her and Olympia’s children, adds a sense of dread to the flashback material. Everyone else in the flashbacks is probably going to die. And they do, but “Bird Box” is not your typical horror movie. It’s refreshingly devoid of big action sequences and CGI, relying more on the fear experienced by its characters than actual supernatural interactions. In a sense, it’s a reverse haunted house movie, one in which it’s not the one house that’s haunted but everything outside of it. How long could you survive with a group of strangers who are increasingly distrustful of each other as rations run short? Bier directs her cast expertly, allowing them nice little character beats that lesser directors would have ignored. Most of the problems with “Bird Box” come back to a thin screenplay, one that too often gives its characters flat, expository dialogue and then writes itself into a corner with a climax that’s just silly when it needs to be tense. I haven’t read the book on which “Bird Box” is based, but it seems like the kind of thing that could work significantly better on the page, where our imaginations can run even more wild regarding what the characters are “seeing” and the scope of the mass suicides. Eric Heisserer's script works better when it sticks to the basics, locking us in what could be the last safe place on Earth and allowing us to ask how we’d behave in such a nightmarish predicament. And it does that just enough to find beats that are honestly tense and terrifying. Happy holidays, everybody.